It has become a global concern to involve women in decision making and leadership roles at the local and national level. However, women participation in decision making at the Ashaiman Irrigation Scheme is very low even though women are the highest producers of food crops in Ghana. 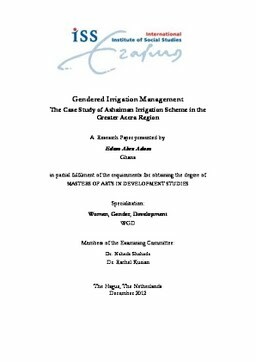 The intent of this study was to critically investigate the underlying reasons for the low representation of women at management level in the Ashaiman Irrigation Scheme located in the Greater Accra Region of Ghana since not much research had been done on women in irrigation in Ghana. The government policy framework on agriculture with the help of international support provided irrigation infrastructure for adequate supply of water to the irrigation farmer’s association for all year round agriculture. The Farmers are supposed to be in charge of the operation and management of the scheme while the irrigation developers act as supervisors. It is assumed that the management of the scheme will involve equal participation of men and women in decision making but the study revealed that women were not represented in leadership positions of the irrigation projects. The research also revealed that lack of education, gender, social norms, the multiple roles of women, long distances from the farms and the large numbers of men against that of women together with inconvenient times for meetings, were most of the factors that militated against women representation in management positions on the Ashaiman Irrigation Scheme. It is hoped that when these concerns are addressed through for example initiating litera-cy programmes for women and recognizing them as partners whose con-tributions were necessary in the total development of the scheme; the objectives of the project would be achieved.